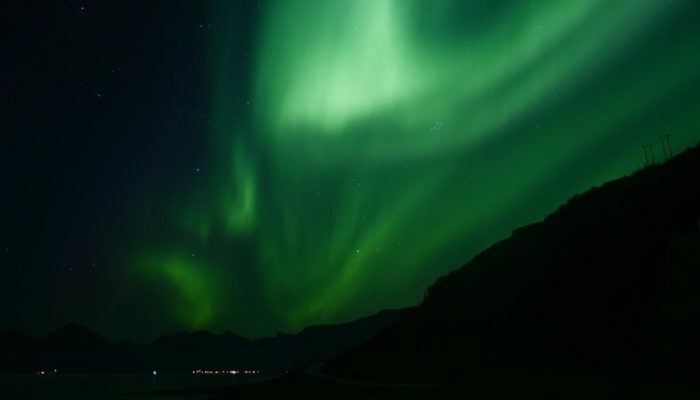 Northern lights in Tromsø, displaying the collisions between electrically charged particles from the sun which penetrate the earth’s magnetic shield and strike atoms and molecules in our atmosphere. Collisions excite the atoms causing electrons to move to higher-energy orbits, further away from the nucleus. When electrons move back to lower-energy orbits, they release particles of light called photons which form the aurora. The green color is produced by collisions with oxygen, purple colors are produced by collisions with nitrogen. Description by Rita Nogherotto, as it first appeared on imaggeo.egu.eu. Imaggeo on Mondays: Gothic Snow Architecture.